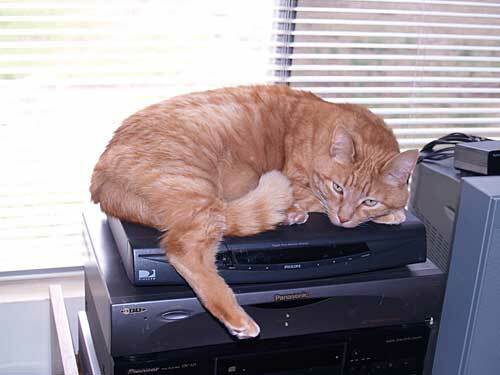 Today is 49 days since my kitty Spot died. There is a Buddhist belief that after someone dies, they will spend up to 49 days in a transition state called “bardo” before moving on to the next life. So relatives and friends of the dead will continue to pray and make offerings for them for 49 days, to try to help them achieve an auspicious rebirth. I wanted to post a memorial to Spot right away, but it was too hard to look at pictures of him and think about him. I thought maybe after one month I would post, but after a month I still couldn’t do it. So then I thought I would post after 49 days. I don’t know if the 49 day bardo applies to animals, too, but if it does, then today Spot is off to a new life. I hope it is a good one for him, and that his suffering is less than it was in his past life. And, I appear to have a cat. Several other people had spotted it before I finally met it on Thursday. 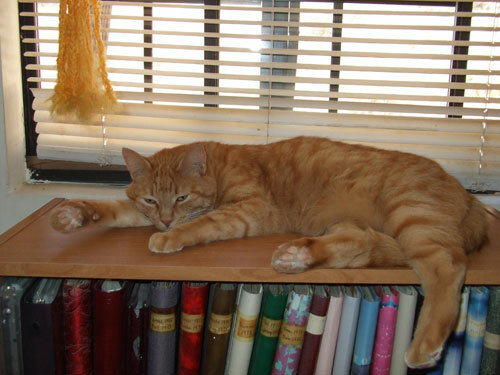 A nice big orange tabby. He was a bit skittish, but quite friendly once he finally decided to come out and say hi. Apparently he’s been living under the house. There was some cat food left there, and I put some out for him, and my brother said he would stop by every couple of days to put out some more, so I’m hoping he’ll be okay until I can move down for good. I hoped he’d stick around until I could get down here for good, but as the time dragged on and there were a couple of long stretches when I couldn’t make it down for a visit, I wondered if he’d go find someplace else to live. I didn’t spot him at all the last time I was here, and this time a week went by and there was no sign of him. So I did, and thanked me by twining himself around my legs so furiously every time I went outside that eventually I tripped over him in the dark as I was coming back from the shed, and we both went sprawling, and I saw no more of him that night. But in the morning he’d forgiven me, or else he was hungry again, and he was back. So it seems I have a cat. Or he has me. Since it looks like he’s here for good, I figured I’d better give him a name. I’m calling him Spot, after Data’s cat. At first, he was an outdoor kitty. He’d been used to living outdoors, and I was still dealing with pretty bad cat allergies, so I didn’t think I could bring him inside. Of course, he had other plans — it was hot in the summer, and I’d leave the door open, and the screen door didn’t always latch, and he was perfectly capable of opening the screen door and strolling in. Usually, I’d pick him up and take him back outside. But he’d come right back in if he had the chance, acting like he owned the place. I’d go outside and sit on the porch with him. I remember that summer, spending mornings on the porch with my coffee and Gameboy, playing Yu-Gi-Oh! games while Spot twined around me and purred. Such perfect, golden mornings! I hadn’t had a cat since high school, since I’d developed such horrible cat allergies I could barely be in the same room with one, and although I’ve always loved cats, I spent thirty years without one. Then I moved here, and there he was! The decision made for me: I had a cat. In late June or so, I got a couple of kittens from my brother’s ranch: Miss Socks and her brother, Felix. Unfortunately, Spot did not want kittens in his space. After a couple of days, he took off and was gone for over a week. I was almost ready to give the kittens back, but finally, Spot came back! I was sooooo happy! I took him into the house and let him stay there after that. I left the back door propped open for the rest of the summer so Spot could come and go as he pleased. He mostly stayed indoors or behind the house, while the kitties stayed in the front, and an uneasy truce was maintained. A year later, though, Felix went out hunting and never came back. After that, things deteriorated between him and Socks. 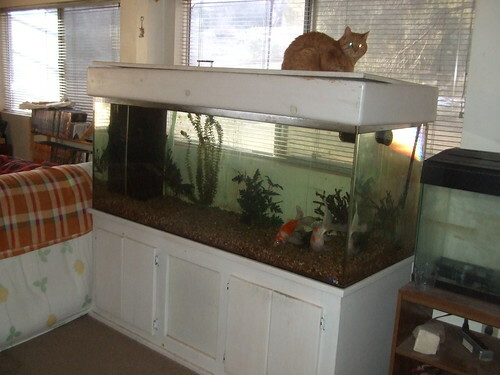 I suppose he thought he’d finally gotten rid of one of those pesky kittens, so now he’d get rid of the other one! And Socks was always hostile towards Spot, too, unlike Felix, who loved everybody and everything and was on his way toward making Spot his friend. 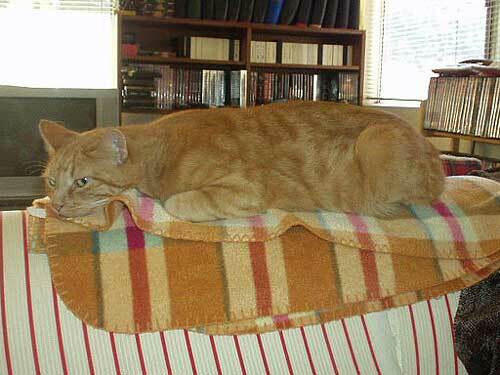 When I had the three kitties, Felix acted as a sort of buffer between Socks and Spot. 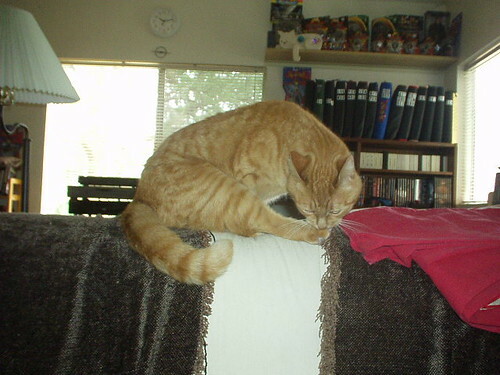 Without him, Spot terrorized Socks until she was peeing everywhere, and I was breaking up fights several times a day. Finally, I put her in the back room — where I’d already set up food and water dishes and a litter box for her, so she could eat and pee in peace most of the time — and closed the door. I thought she’d be meowing to be let out after a while, but she never did. 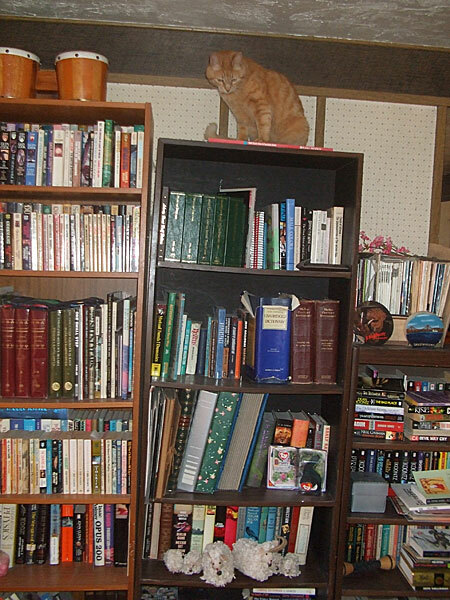 She seemed to enjoy having a room of her own, safe from that mean old orange kitty. So she lived in there, and Spot had the rest of the house to himself. After a while, I thought Socks must be lonely living in a room by herself most of the time, so I got Jerry to keep Socks company. It turned out that Socks didn’t really want any company. She tolerated Jerry, but they never got to be friends. 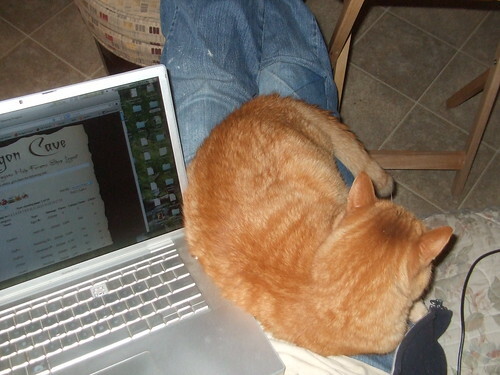 Spot was a very affectionate kitty, once he got comfortable wtih me. 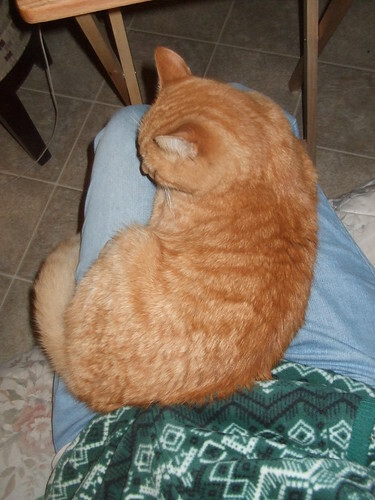 He liked to sit on my lap for hours — and he’d get mad if I tried to pick him up and move him off me. He’d never really learned to get along with people as a kitten, and he could be rough sometimes. He’d take a swipe at me or even bite me if he didn’t want to be moved. I finally figured out that the only way to get up without having him swipe at me was to just stand up and dump him off my lap. Same if I wanted to sit down and he was in my spot — I couldn’t pick him up and move him, I’d just sit half on top of him and he’d jump up and run off. But if I picked him up and held him, he’d snuggle against me and grip my shoulder with his paws and purr and let me walk around with him and even dance him around. 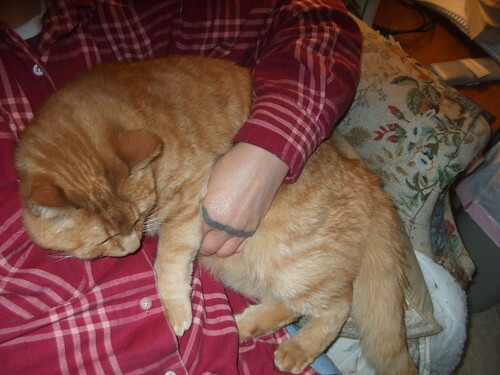 He loved to be hugged and snuggled and petted. He’d come when I called, most of the time. I remember one time, I was standing on the porch and he was outside down near the road. 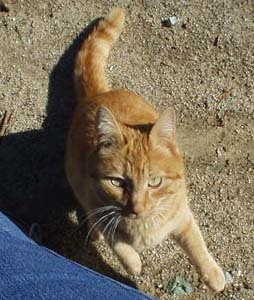 Just to see what he’d do, I called, “Here Kitty, Kitty, Kitty.” He looked up at me, then took off running toward me as fast as he could go, across the yard and up onto the porch and right to me. I petted him and told him he was a good kitty! If I wanted him to sit with me, I could call him and pat the seat beside me or my lap and he’d jump right up. 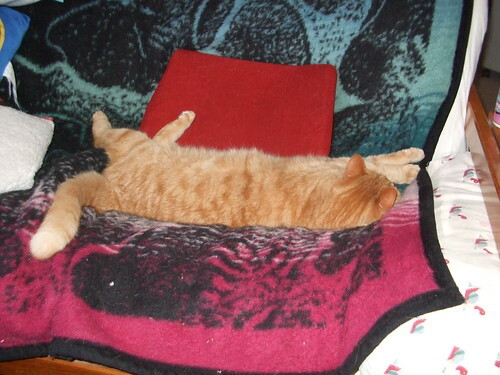 I often wondered how such an excellent cat came to be living as a stray at my house. I thought maybe someone had abandoned him there. 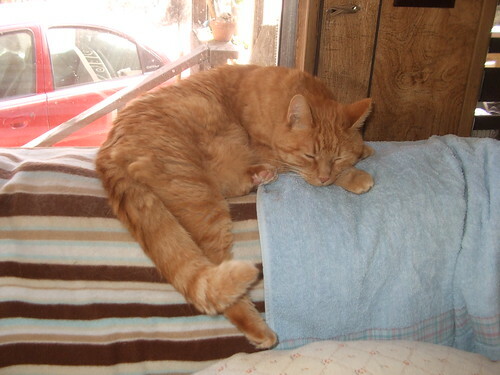 It wasn’t until several years later that I found out his story: one day while I was out, my mom was at my place outside in the yard with Spot when the neighbor up the road drove by. Our neighbor recognized Spot and told my mom that she’d taken in Spot and his brother as kittens when their owner didn’t want them. But Spot and his brother kitty didn’t get along, and eventually Spot’s brother chased him away. 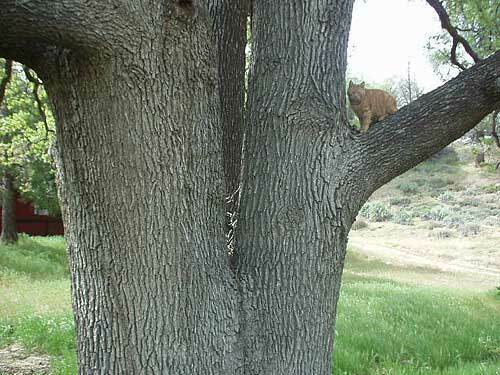 The neighbor thought he’d probably been eaten by a coyote or a bobcat, and was surprised and glad to see him still alive and in a happy home. He was clearly a very smart and savvy cat, to be able to survive on his own all that time, until I could come and give him a home. 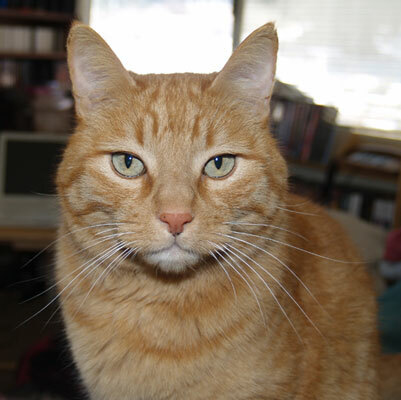 But that explained why he’d never learned to get along with other cats, if his own littermate had chased him away. When I talked to him, he seemed to understand what I was saying. He didn’t talk much, but when he did, you could tell it was because he had something to say. He’d look me right in the eye and meow like he expected me to know exactly what he meant. He could open doors if they weren’t latched — he’d hook his foot around the screen door or a cupboard door and pull it open. Or, if it opened in, he’d just put his big, hard head against it and push it open. Sometimes he’d go inside a cupboard and check things out. I’d wonder where he was and go around the house opening cupboard doors, and he’d stroll out like he belonged there. My mom likes to tell the story of the time he came next door to get her to come to my place and let him in. This is how it happened: after she moved in next door to me, he’d go up and visit her now and then. Sometimes I’d let him outside when I left for the library in the morning, and then later she’d drive into town and get the mail. On her way home, she’d stop at my place to drop off my mail, and she’d let Spot in the house. One day, though, I didn’t have any mail, so she drove on by and went home. But when she got there, Spot was waiting for her on her porch. He’d seen her drive by and went next door to get her. He started down the hill to my place, stopping and turning to make sure she was following. Once he saw she was coming, he took off back home. When she got to my place, he was waiting by the door for her. So she opened the door so he could go inside. 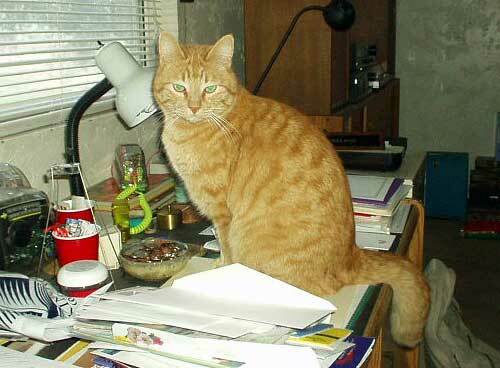 He loved to hunt mice and squirrels and lizards and anything else he could get, and generally he ate what he caught. One summer, he went out every morning and caught himself a chipmunk and brought it up onto the porch to eat. He’d eat it on the porch doormat, consuming everything but the tail. After he was done, I’d take the doormat and toss the tail down into the yard. After a month or so, I went down into the yard, and was startled to see it carpeted in chipmunk tails! They were everywhere. If he could, he’d sneak into the house with his prey. 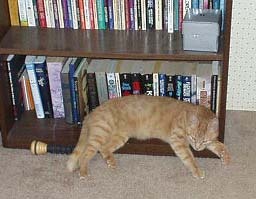 Then the mouse would get away from him and hide under the desk or the couch. He’d lose interest and walk away — and I’d be stuck with a rodent in the house! I’d tell him, you’re supposed to be keeping the mice out of the house, not bringing them in! I’d try to remember to check his mouth before opening the door for him, but sometimes I’d forget. Eventually, he learned to dash past me and run into the bathroom with his prey. I’d close the door and let him finish it off. I worried about him when he was out late, but he knew how to take care of himself, and always managed to avoid the coyotes and bobcats and other predators out there. What he couldn’t avoid were all the various health problems that plagued him. About a year after we moved in, he started coughing, but a steroid shot fixed him right up. The vet thought it was mild asthma. A year or so later, he started having trouble peeing. He had crystals in his urine that were blocking him. Putting him on special food fixed that. He got ear mites really bad one summer, and it took months of medicines and ear drops to finally clear them up. He got various injuries that had to be treated. But he was a tough guy and bounced right back from most everything. We evacuated three times for fires. The first time wasn’t really necessary — I’d gotten spooked by a panicky neighbor and spent the night at my mom’s place in town. Whenever he was in a new place, he inspected it thoroughly, sniffing around and peering into every corner, until he was satisfied he knew where he was, and then he was fine. I remember my mom telling me that, while I was at work, at one point she couldn’t find Spot and was worried that he’d gotten out. 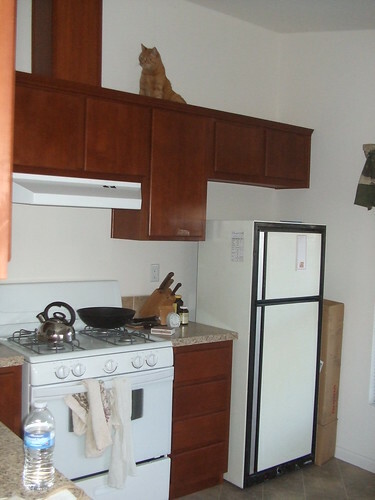 She looked all over her apartment, but couldn’t find him, until she opened the cupboard above the kitchen counter next to the refrigerator — and there he was, looking out at her! He’d apparently thought it was a good place to hang out. The second time was for the West Fire — the one that started a quarter of a mile from my place and burned half our mountain. Mom had moved up next door to me by then, so both of us and our cats packed up and went to my brother’s place. At first, we put Spot in one of the rabbit hutches. He didn’t like that at all, and spent most of the time sitting in his litter box. Sleeping on the fold-out bed in my brother’s guest house with my kitty curled up next to me purring, I thought, he doesn’t care that the house is gone. He’s happy because he has me. 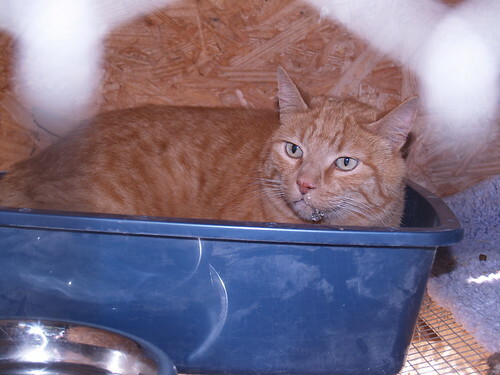 A safe place to stay, food and water, someone who loves him to snuggle up with at night. That’s all he needs. So I take a lesson from my kitty. I have everything I need. All will be well. And it’s true. I miss my kitty way more than I ever did my house and everything in it. After the fire, we moved in with my mom while I got my place cleared off and a new home built. 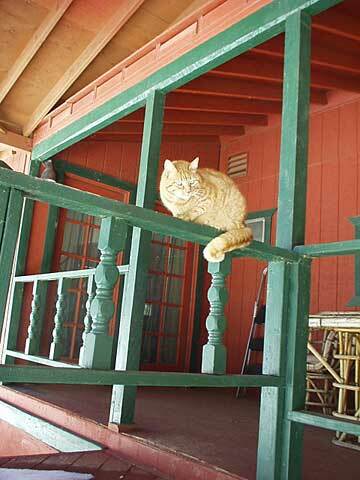 We fixed up her back porch for the girls, Socks and Jerry, so Spot could have the run of the house. He was familiar with her house, having visited many times before, so he didn’t have to get used to a totally new place. On the other hand, he also knew that his own house was right next door, if only he could get to it! He snuck outside many times during the first few months, trying to go home, but we mostly got him back in fairly easily. One time, though, he was gone for hours, and came back with soot up to his knees. He’d been out exploring, and apparently realized finally that his house was gone, and we didn’t have too much trouble keeping him in after that. He didn’t really like being at my mom’s place, though. He complained a lot, got very clingy and irritable. That was also when he first started having kidney problems. Probably his heart trouble was developing then, too, although we didn’t realize it at the time. When we got into our new house, though, he relaxed and was much happier. He seemed to know he was home, even though the house was different. I think he realized it was in the same place. He only spent a few days checking things out before he settled right in. We had a little over a year in our new home. I’d noticed he was losing weight, and he was coughing a lot more, and things went quickly downhill from there. His last few months were stressful and difficult, and I don’t want to dwell on them. We had eleven good years together — not enough, but then, it never is. Farewell, my beloved Spot. Gate gate paragate parasamgate bodhi svaha.